It’s a busy week in the design world. I spent the day yesterday previewing new tabletop introductions at Forty One Madison, today and tomorrow I’ll be reporting live from the D&D building in New York as a sponsored blogger for fall market and then will be doing the same from the enormous venue at High Point. In the meantime, however, I received some exciting news. I was so honored to learn that Currey and Company, the well known manufacturer of distinctive lighting and home furnishing products had named one of its chandeliers after me! I am proud to present Quintessa. 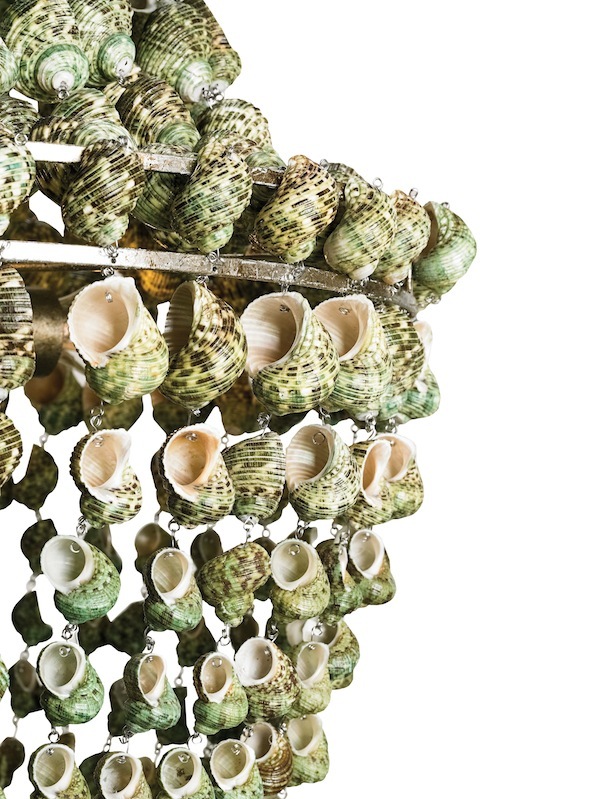 Made of wrought iron and shell, it is a new addition to the popular Marjorie Skouras line for Currey that so successfully debuted last year. 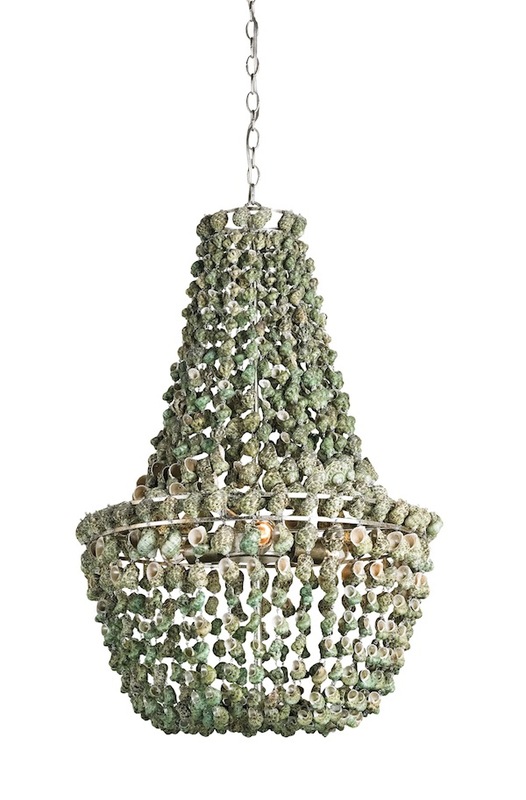 The undyed turban shells are natural green in color and the combination of the materials and Empire shape continue to reference the jewelry inspired melding of old Hollywood glamour mixed with a “love for unusual design and oddities like taxidermy, faux bois and seashells” that mark the collection. I will be sharing this and more from Currey’s new collection at market but wanted to send a big thank you to Bethanne Matari and the team at Currey for this distintinctive honor! This entry posted in interior design. Entry Tags: Lighting, Marjorie Skouras, Quintessa chandelier Bookmark the permalink. Congratulations, that is an honor. What a beautiful piece. Looking forward to learning more about the line! Just gorgeous and perfect for a beach setting! Did you see all the new showrooms opening up at the NYDC? We need a field trip! This is fab and the name incomparable! Wow, Stacey. That is wonderful!! So lovely, congratulations. Love it. Hope to see you at High Point Market next week. Well, I never! That is just so nice – congratulations!!! franki p.s. LUV the chandy!! Congratulations, Stacey. I look forward to articles and posts in the making. A busy time of year for you. Wow! Congratulations. And it’s just as lovely as you are. Looking forward to your take on fall market and High Point! What an incredible honor!!! Well deserved, Stacey….you do the design world proud! What an honor -and it’s gorgeous to boot! Nice meeting you today!, and congrats on the fixture. Congratulations and what an honor! Absolutely love Currey’s light fixtures. Hope to use it in one of my projects one day!! Maybe I’ll bump into you at High Point! 78 queries in 0.372 seconds.